The Meritas Awards take place annually and support the promotion of curling through the recognition of the exceptional achievements of volunteers, craftsmen and craftswomen, athletes and the various curling events that are part of the program. All nominations are sent to Curling Québec. Once the subscription period over, Curling Québec sends all the submissions to the corresponding regional association. They then determine the regional finalist in each category and forward the list to Curling Quebec who will determine the provincial winners. Winners are announced during the Annual General Meeting. The Meritas awards are individually presented throughout the following curling season. The date and location of the presentations are decided between the recipient and the board of directors. Applications sent to Regional Associations by Curling Québec: from April 30th to May 7th of the current year. Selection period of the finalists of each category by the Regional Association: from May 1st to 31st. They also let Curling Québec know about their choices. Winners selection period by Curling Québec: June 1st to August 31st. 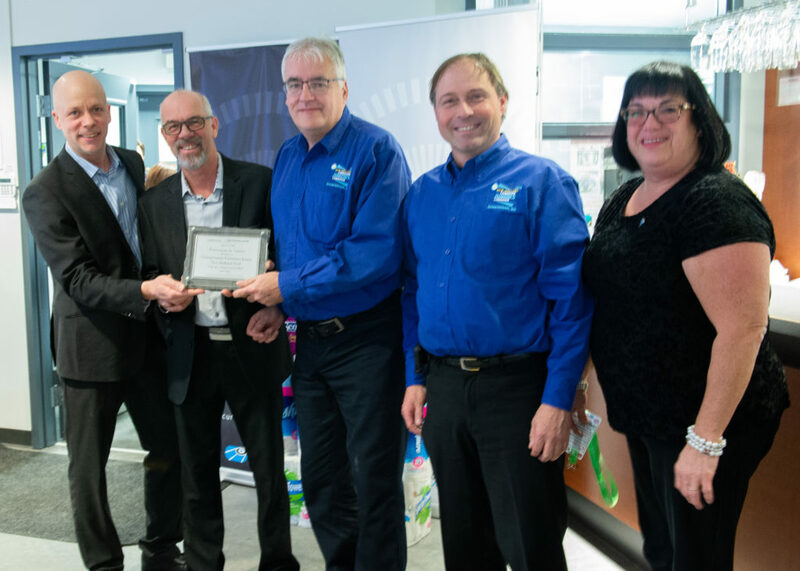 The principal objective is to pay tribute to those men and women who, in their individual ways and through their involvement and passion for the sport, have contributed to the promotion and advancement of curling in Quebec. Also, the goal is to foster the visibility of Quebec curling in an atmosphere where our sport is being feted and celebrated and to create ties between curling in Quebec, the business community and the general public. With the exception of the Special Tribute and the Outstanding Achievement, the achievements and grounds justifying the nomination must be have been established between the May 1st and April 30 of each year. Once the winners have been selected, a congratulatory letter will be sent to each award recipient. The list of recipients will be posted on the CQ website and in the annual report. As per the requirements, all candidates (individual or curling club) must be affiliated members of Curling Quebec. A maximum of two (2) winners will be selected per category. Each regional association, curling club or individual may present nominees for any of the recognized categories. After the closing date, Curling Quebec may choose to propose or add nominations if there are not enough entries from the regions. It is the responsibility of the Regional Associations to prioritize nominations from their regions in each category. Each submission must be accompanied by a duly completed nomination form. 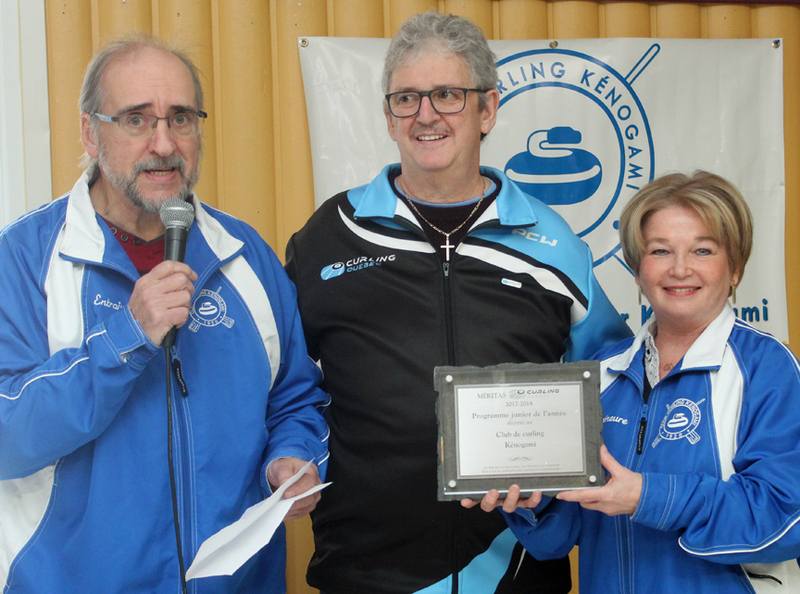 Nominations must be forwarded to Curling Quebec by the established due date. The submission deadline is May 31st of each year. Nominations for all categories except the “outstanding achievement” category will be accepted. 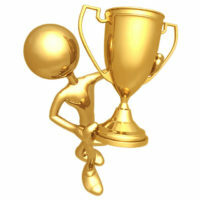 One “outstanding achievement” award can be awarded each year. Exceptionnaly, there may be 2 awarded in one year. It is up to the Board of Directors to decide if the “outstanding achievement” award or the “special tribute” award will be awarded or not in a given year. Click on this form (online or word version) to submit an application for one or several categories and fill it out online. Don’t forget to send any other pertinent documents by mail to Curling Québec. 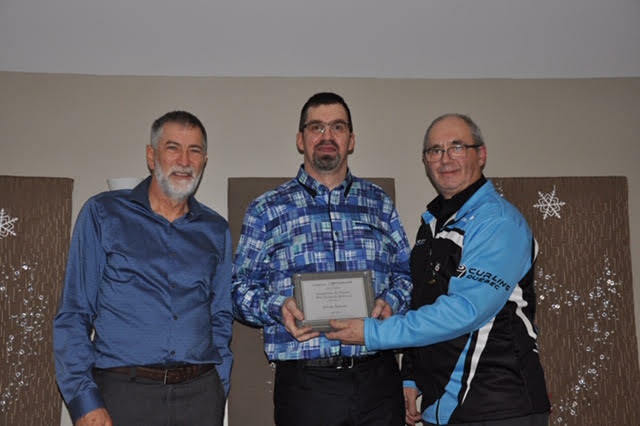 A person recognized for their involvement, expertise, judgement and officiating abilities in curling during provincial, national and/or international competitions. Any Coach from Quebec involved with his or her curling club at the beginner level and offers clinics, coaches new participants/members or is involved with the club’s junior program. This individual is characterized by his or her availability as well as ability in teaching the basics of curling. It is imperative not to confuse this individual with a team Coach, whose primary task is the coaching of one or several teams. The award for Event of the Year will be given to a hosting committee or curling club that staged an event or created a new one. The event in question must be recognized as having been a quality event and the hosting committee / club must demonstrate the positive effects the event had on the promotion of curling, whether that be locally, regionally or provincially. 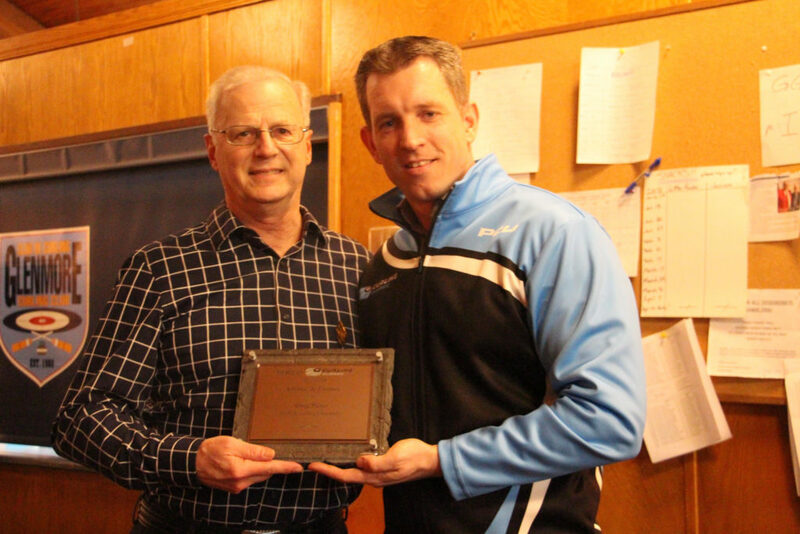 A person recognized for his or her exceptional contribution and support with regards to the promotion and development of curling in Quebec. This award is intended to highlight achievements accomplished within the year and not those of the individual’s overall career. 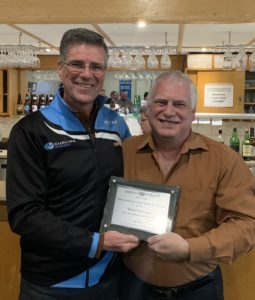 A person recognized for their expertise in the training and development of athletes and teams and for his or her contribution to curling in Quebec. Nominees must be certified through the National Coaching Certification Program (NCCP). The award for Junior Program of the Year will be given to a club offering a junior program that is characterised by its quality and originality. The number of participants, volunteers and partners involved with the junior program will be important factors that will be considered in determining a winner within this category. 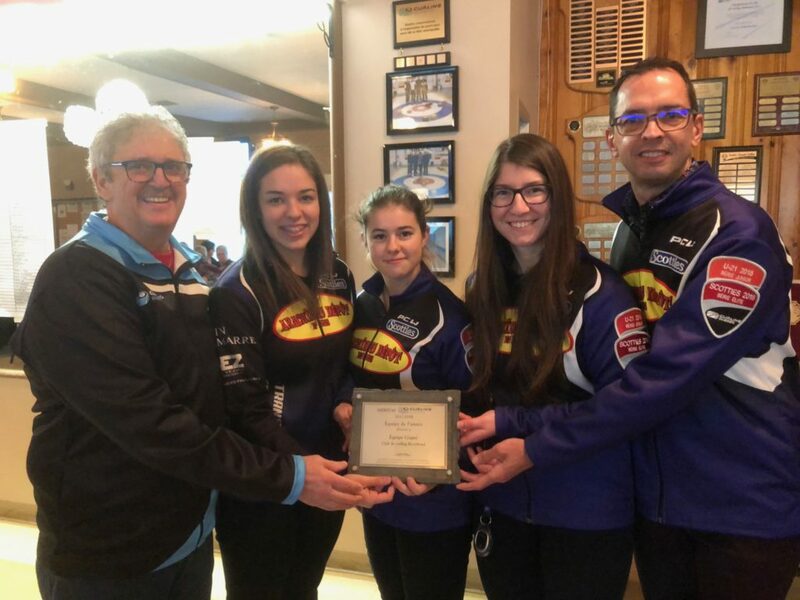 Any curling club in Quebec that is recognized for the enthusiasm of its members, the originality of its programming and services as well as for the participation levels and performances of its membership at various activities and events. This award is intended to honor the most active club which offers the best experience to its members. Factors such as increased membership, initiative, promotion of the sport, etc. will be considered in the selection process. A women’s, men’s or mixed competitive team that significantly distinguished itself during provincial, national and/or international competitions. Any Ice Technician in Quebec involved in the making and maintenance of the ice in a curling club. This Ice Technician is recognized for his availability and desire to provide his fellow members with the best ice conditions possible. Any person or organization, should it judge it appropriate, is invited to submit a Special Tribute proposal to Curling Quebec. This proposal is to mark an exceptional performance, or an exceptional contribution to the world of curling achieved by a Quebecer, whether as a volunteer, curler, builder, sponsor, journalist, etc. Curling Quebec reserves the right to add proposals, should it feel this to be appropriate. Only one Tribute will be awarded each year. This award takes an individual’s overall career into account. The choice of the Special Tribute winner is made by the Board of Directors of Curling Quebec. Occasionally awarded by Curling Quebec’s Executive Committee and/or through the recommendation of the Selection Committee, this award is designed to highlight the outstanding achievement of an individual(s) that does not necessarily factor into any other existing category. The award given annually to a journalist who contributed to the promotion of curling and all that surrounds that sport. 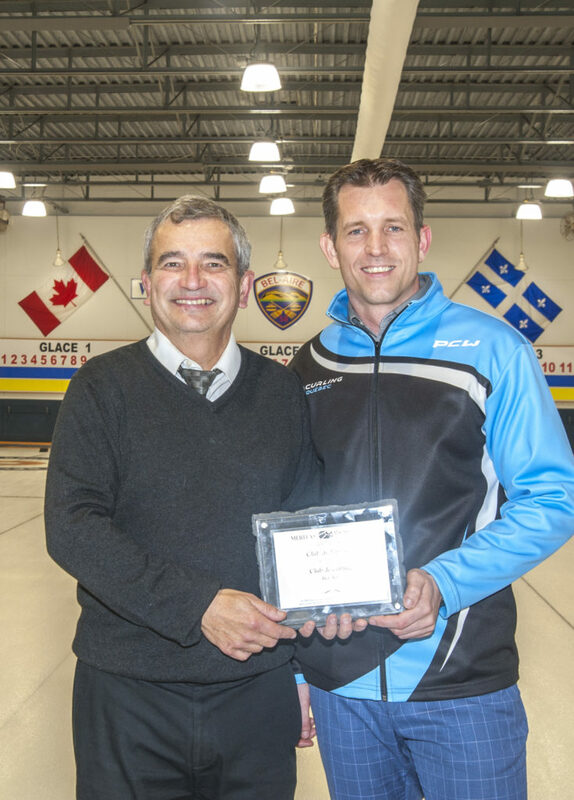 The 2017-2018 Ice Technician Meritas Award was given to M. Stéphane Delisle (right on picture) of the Victoria curling club by the Vice-President of Curling Québec, Rémy St-Pierre (left on picture) on February 16th, 2019. More than 200 curlers attended the 132th anniversary of the Victoria curling club ceremony. Sunday January 13th, 2019, Marc-André Robitaille, general manager of Curling Québec, gave the Meritas Award Event of the Year for the Championnat Canadien Junior 2019 to Jean-François Morand, president of the Grand-Mère curling club, and to Alain Boucher, president of the host comitee, and to Sylvain Desaulniers and Johanne Charest both of the organisation comitee. 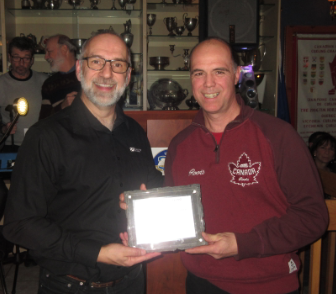 The President of Bel-Aire curling club, Mr. Denis Pelletier (left on picture) received the Club of the Year Meritas Award from Mr. Stefan Sasura (right on picture), secretary of Curling Québec. 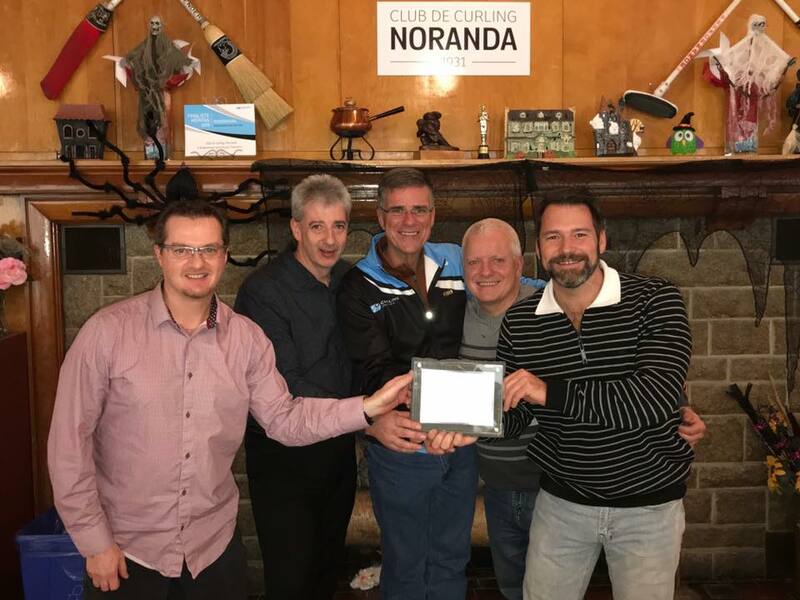 André Bellavance, president of Curling Québec, gave the Outstanding Achievement Meritas Award to the Challenge Nord-Ouest Air Creebec. 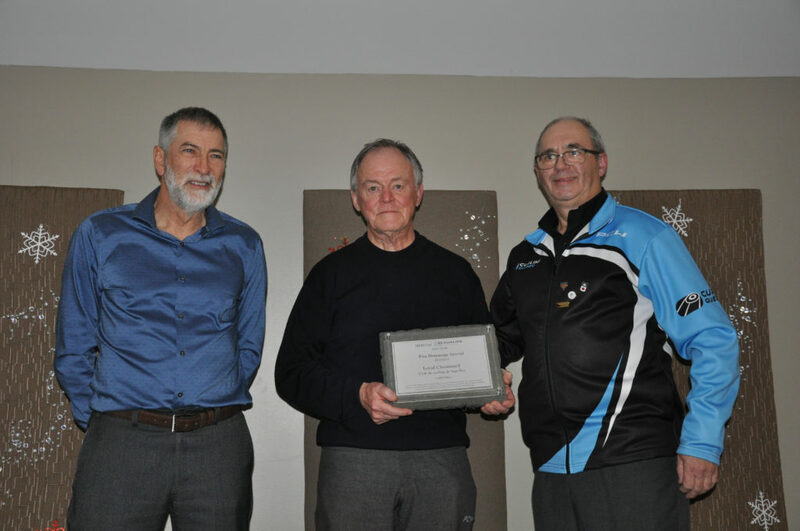 The Outstanding Achievement of the Year Award 2017-2018 was given to M. Jim Thompson (left on picture) of the Lennoxville curling club by it’s President, Mr. Ralph Fanning (right on picture). The ceremony was held last April 13th during the end of the season dinner. 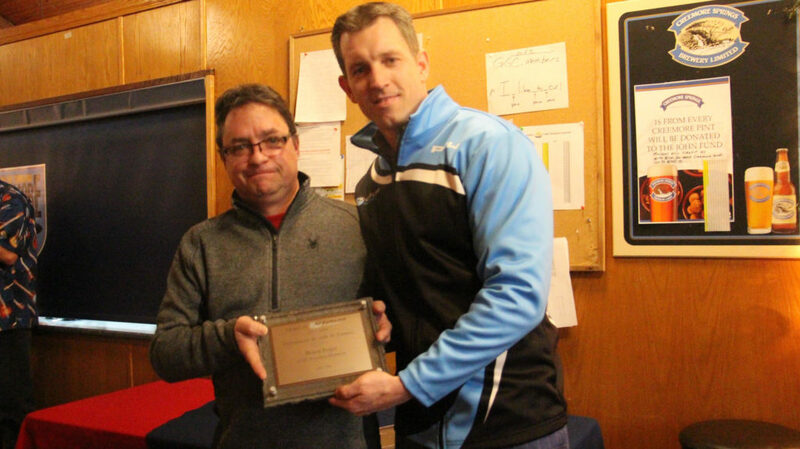 Saturday, December 15th, Serge Bourassa, director of Curling Quebec alongside with Daniel Beaulieu, President of the Sept-Îles curling club, gave the François-Béliveau Journalism Meritas Award to Sylvain Turcotte. Congratulations to M. Turcotte for the great coverage our sport in the media. On the picture: M. Beaulieu, M. Turcotte and M. Bourassa.